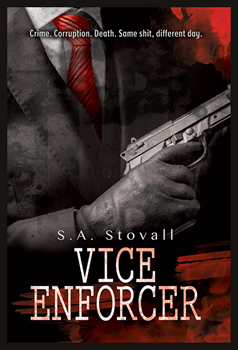 Author S.A. Stovall brings us the next installment in his Vice City crime series featuring ex-mob enforcer Nicholas Pierce. Eight months ago, Pierce faked his death and assumed a new identity to escape sadistic mob boss Jeremy Vice. With no contacts outside the underworld, Pierce finds work with a washed-up PI. It’s an easy-enough gig—until investigating a human trafficking ring drags him back to his old stomping grounds. But he’s not going out without a fight. The Big Thrill recently caught up with Stovall to discuss his book as well as what it takes to craft great suspense. What first drew you to writing crime fiction? While I was going to law school I worked at the local drug court. The legal system has all sorts of crazy stories—truth is definitely stranger than fiction—and I found my knowledge on the matter made for easy writing. Additionally, who doesn’t love a good crime story? It’s sad, but crime plays a major part of life no matter the place or culture, so it’s also a very relatable subject. Tell us about your character, Nicholas Pierce. What has his journey been like up to this point? Pierce is an ex-mobster. For 20 years he worked as an enforcer in a crime syndicate, and while he was good at his job, it ultimately left him with a bad taste in his mouth. In my debut novel, Vice City, he realized he needed out of the business, but it was one hell of a journey given the turf war going on all around him. In VICE ENFORCER he’s become a private investigator. His intimate knowledge of the streets helps him solve crimes (even if he’s not that great with the paperwork). It’s his goal to become licensed, but when a local cop starts to put together the pieces to his past, he may end up in jail instead. Exciting stuff, if I do say so myself! Stakes. There has to be a real sense of “oh my gosh, I hope he doesn’t fail because then it would mean something awful will happen.” Sometimes this is physical danger, or other times it’s the loss of something personal or precious. Pierce has to deal with both. He stumbles upon a human trafficking ring (all that physical danger) but he also has to maintain his disguise lest he get thrown in jail and separated from everything he holds dear (the loss of his lover). I like a mix of both and I think all the really amazing thriller writers have both in their stories. With the stakes that high, it’s hard not to get invested. I hope readers enjoy the action, crime, and redemption story. I love a good adventure, and I especially love protagonists who want to find a place in the world, especially when they think they need to do better than they ever have before. It’s compelling, and it makes me want to strive to be a better person myself. It’s told from the perspective of an ex-gangster who wants to join law enforcement to make a life for himself and make a difference. There’s a lot of insight into what a criminal thinks about other criminals, and Pierce uses his knowledge of criminals to get the upper hand. I read a lot about police galas. Most of my cop friends don’t attend them, and since one features in my book, I had to read up on a few to get a good grasp of the events. Very interesting, actually. Pierce falls in love with one cop, and has a secret crush on another he won’t admit to anyone. It’s a cute side story to an otherwise gritty noir-style story. Stephen King and Robert A. Heinlein, definitely. They both have produced so many works I love and re-read. I want to be as prolific as them. Even if you don’t like everything they do, you’ll most likely enjoy something. 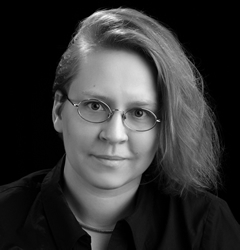 To learn more about S.A. Stovall, please visit her website.